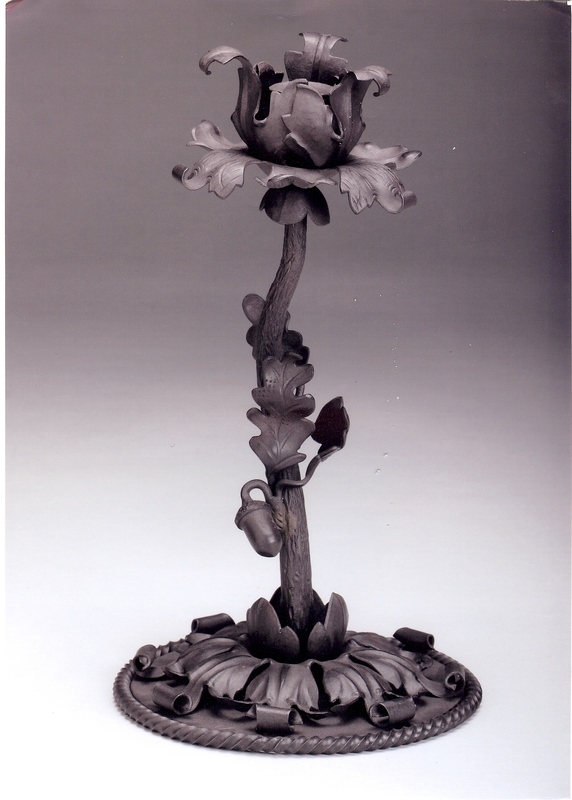 “Candlestick 2005.” 6 1/2″ x 12″, mild steel, black Gilders Paste finish. Photo by George Lottermoser. 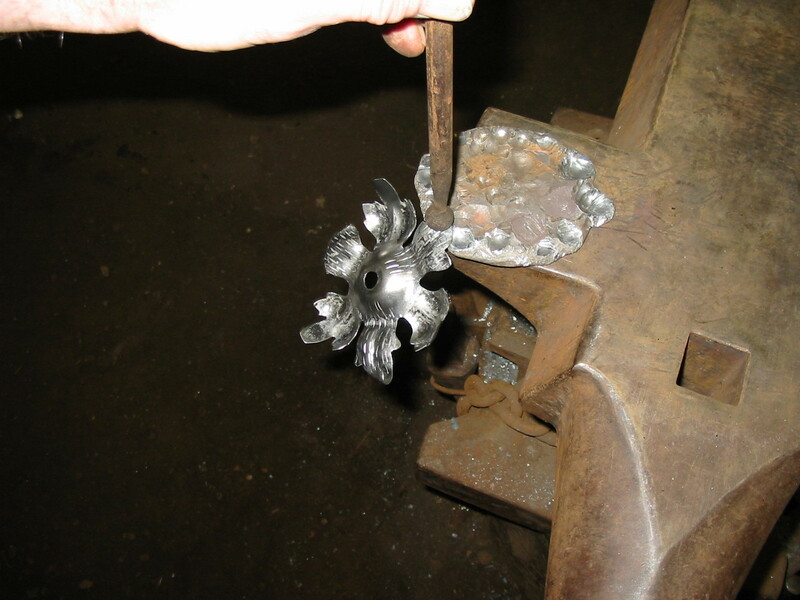 There are different processes of repoussé, as explained in an earlier discussion here. Today we will take a closer look at the process of sinking. 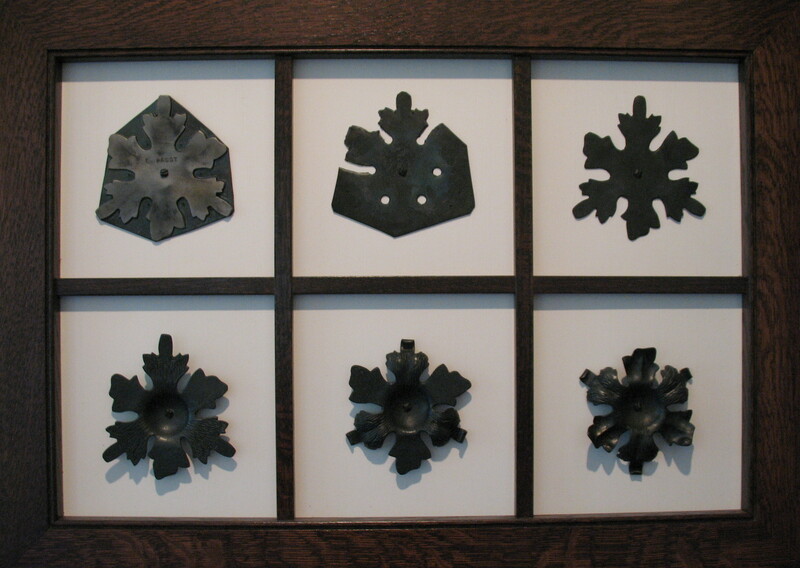 The below-story board shows the development of a bobeche, the pattern of which was used for a chandelier I made for the “Captain Frederick Pabst Mansion“ in Milwaukee, as well as for the candlestick shown above. Note: All of the work shown below was performed cold (without applied heat.) All photos below were taken by me. 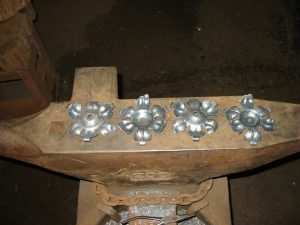 The next series of images will show you some of the techniques and tools used in sinking. 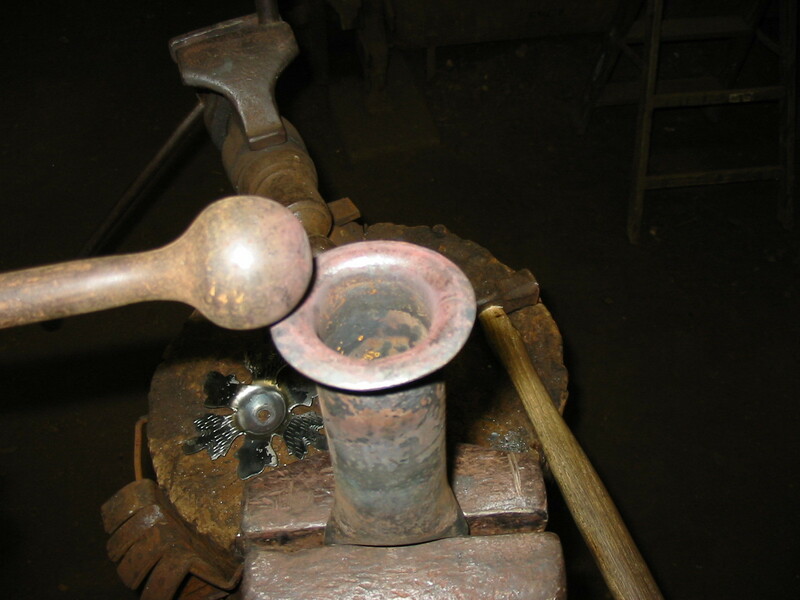 The image below shows a flared tube, and a ball punch that was used to sink the middle portion of the bobeche. 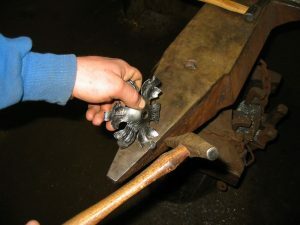 Before any sinking begins, all of the surface detail is applied to the pattern with curved and straight chisels. This next image shows the above tools in action. After the middle has been sunk, the middle veins on the individual leaves are sunk down into a hardwood stump. 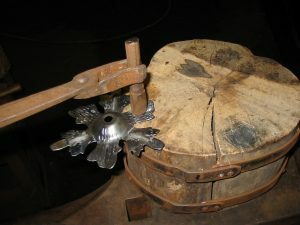 The stump has a slight crease-like depression in it to allow the material to move down. (The shape of the depression would be a little larger than the impression made by the punch used.) The punch used has a slightly curved blade, and instead of a sharp chisel edge, the edge has been lightly ground so it pushes rather than cuts the metal. Using the same stump, but a different depression, the lobes of these leaves are roughed in with a large ball tool. The only way I can describe the depression is this….the depression looks like it would cradle the buttocks of a gnome quite comfortably. The image below shows a smaller ball tool refining, in effect planishing (smoothing) the lobes. Next, dimple-like features are added using a smaller ball tool to give more life to the leaves, adding slight flip to the tips. 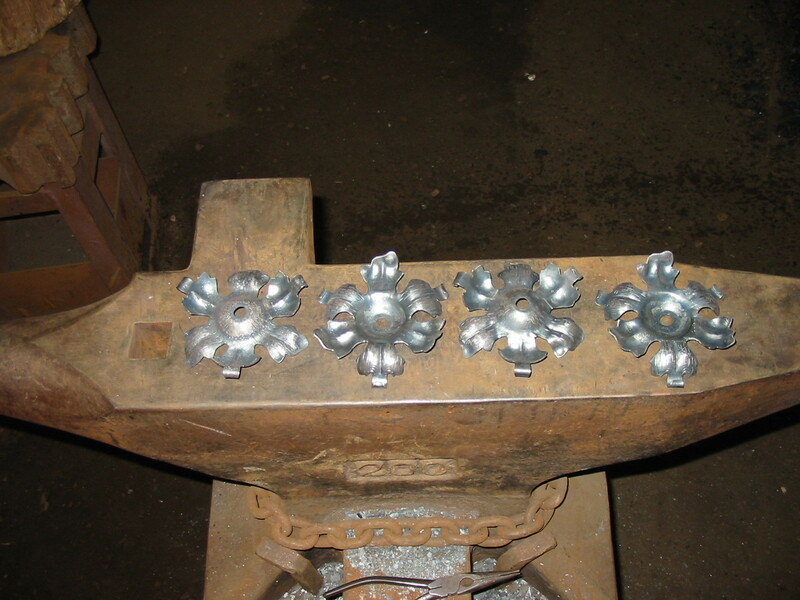 The back-up in this case is a lead block. 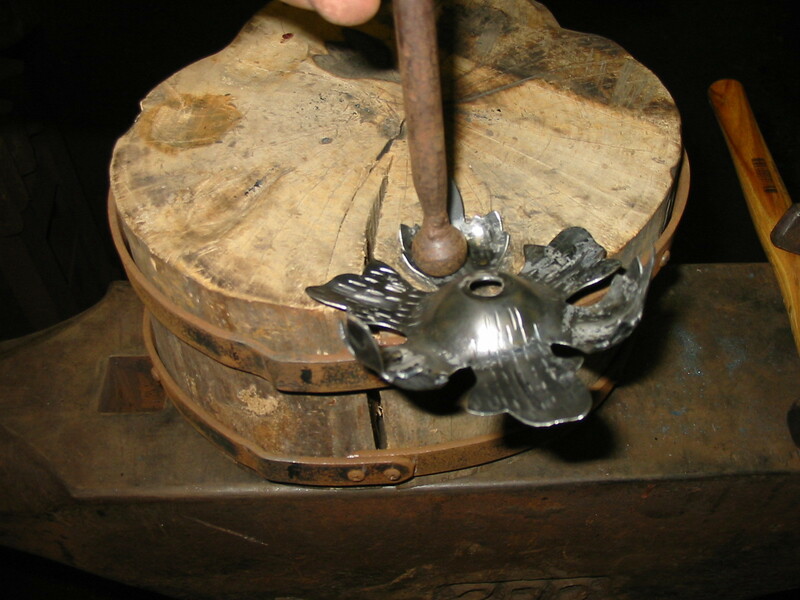 Finally, on three of the leaves, the ends are scrolled cold, over the edge of the anvil using a small hammer. 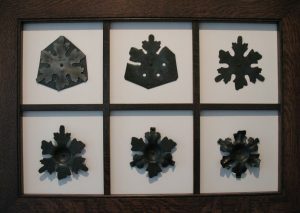 Below are four of sixteen finished pieces, ready to be applied to the chandelier. 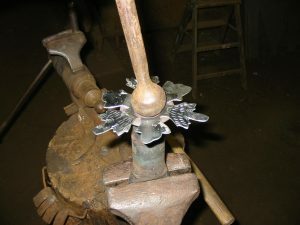 Refer to “Ironwork Processes” if you wish to see the “French Repoussé ” process, otherwise known as the “Hammer and Stake” method. “The problem is not that there are problems. The problem is expecting otherwise and thinking that having problems is a problem.”…..Theodore Rubin, Author. 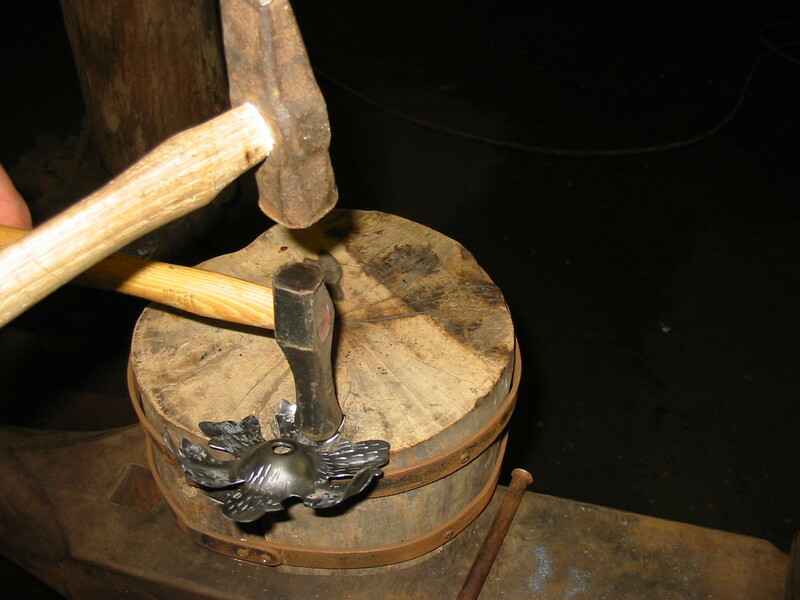 I do a lot of repousse in my armour making. It is a quick and easy way to add value to an item. My thought is that “is this really repousse”? I believe it could be said that it is indeed a form of repousse’, but not of the process or discipline that most would recognize it as such. You are working the material from both sides, and utilizing much of the process, i.e. sinking and raising. One of the finest works in metal was by a fellow I met in Colorado at the Rocky Mountain Smiths conference about 10 or so years ago. His name escapes me. He had made a suit of armor, and there wasn’t a hammer mark, crease, or any distortion in any one piece. I believe he said he had roughly 20,000 hours(?) invested in making it. It was absolutely gorgeous workmanship. I am not a fancier of armour, however I could easily appreciate what he had made. Really beautiful work … I don’t imagine you have any more of those candlesticks for sale?? Hello Matthew, Thank you for the compliment. I do not have any readily made, but can make them to order. They range in price from $1,500 to $2,500.